Not very popular destination; to go only when there is snow coverage at low elevation; in spite of moderate height, it has a wonderful and interesting environment. The reputation of that (northern) slope is that often snow has good quality and so it was . 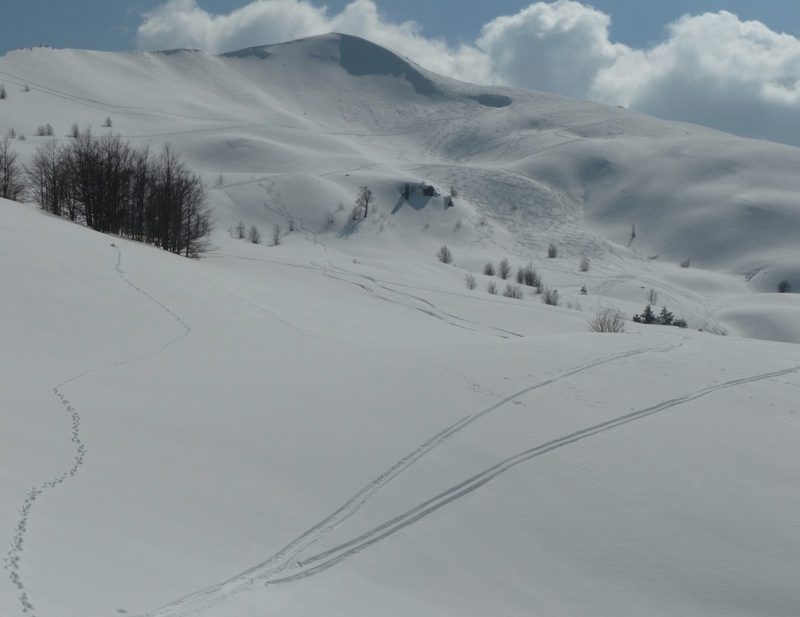 Not very popular itinerary, to do only when at low elevation there is snow coverage, gives unexpected satisfactions if you accept the quite long approach on a forest track. We started from Fontanini (1000m) which is after Merizzana, because the road towards the oratorio di Monticello (Monticello chapel) was not snowploughed yet. We followed a long forest track (3Km) then we went uphill through a grassland slope: first heading to Colle Boschetto ridge then, with a long traverse bypassing it, we entered in the nice northern Nuda peak slope.Comparing to the correct route, we went too high, doing traverse too much close to the ridge. Fortunally the snow was stable, but it is recomendable to go slower (about 1500m height). We went uphill on the counterfort on the right named “Costa della Nuda” and we got to the summit of Nuda peak (1775m) 2h30′. The descent was on the northern slope and, since the snow was wonderful, we kept going downhill up to 1480m height. 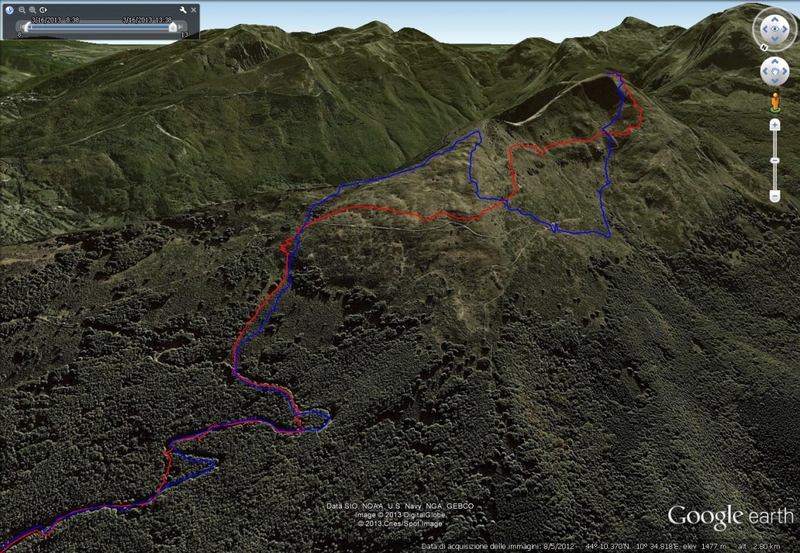 After that we go again uphill to Colle il Boschetto (1684m) (35′), to enjoy another funny descent. We had been here 2 weeks ago but the fog had ruined that tour (photo); we had tried the other itinerary that get to Nuda summit going through Colle il Boschetto then on a not simple ridge. Effectively, some friends of us this time, tried to pass through that ridge but they found hard snow so they had to come back. With the additional ascent to Colle Boschetto the total difference in height is 1050m (4h30′). 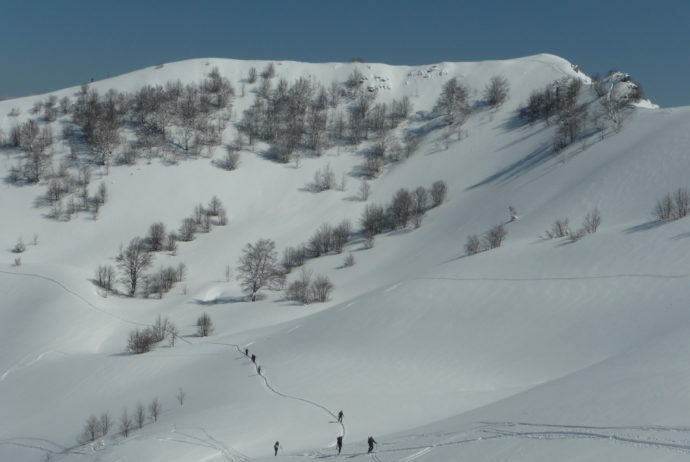 I did this itinerary with Ski touring Group “A. Bafile” – Italian Alpine Club, Section of Florence.